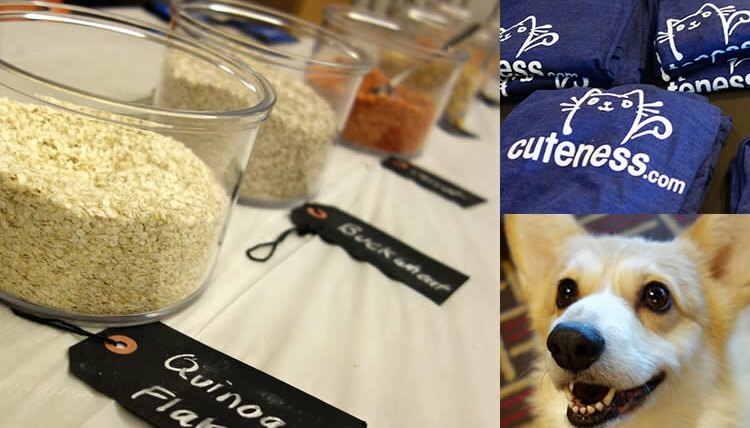 Blogpaws Conference 2015: Our Favorite Finds! Groom Genie - A grooming brush with special bristles that promise to not only remove knots from your pup’s coat, but to also de-stress your pet by facilitating a sense of calm. Plus, its handle features an ergonomic design. We can’t wait to try it out! Tuggo Dog Toy - a super-durable, water-weighted tug toy that’s actually been tested and approved by real wolves and lions! Suffice to say, this toy will probably last you a lifetime...and then some. Human Grade Pet Food from The Honest Kitchen - There were lots of vendors selling all-natural, minimally-processed, wholesome pet food (which certainly makes us happy), but The Honest Kitchen stood out by allowing conference-goers the chance to design their own dog or cat food blend on the spot using dehydrated whole foods which can then be reconstituted with water when ready to use. Pretty darned cool. Trendy Pet - We're suckers for well-made pet products that also look great in the home, which is why we're big fans of these sleek and modern custom-made raised pet feeders by Trendy Pet. Smart Cat All Natural Litter - This clay-free clumping litter by Pioneer Pet is 100% dust-free and is made entirely of farmed, chemical-free grass! They also sell a sleek line of stainless steel drinking fountains, which would be the perfect addition to any modern-style home. We’d also like to mention the far-too-many-to-list-here uber-stylish cat products we ogled within "The Cat Style Lounge"—a special cat-centric area on the Blogpaws exhibit floor curated by Cat Style Expert, Kate Benjamin. Fans of Animal Planet’s My Cat From Hell starring Jackson Galaxy may recognize Kate (founder of Hauspanther) from the show. Hauspanther’s stunning line of loungers, scratchers, towers, etc. definitely proves that cat furniture can, indeed, be chic. Last but not least, we also met some nice folks from The Cat Writer’s Association (CWA)—an organization that provides support for writers (both print and web) specializing in all things feline! Who knew such an awesome group existed?! If you’re such a writer, or would like to become one, we encourage you to check out their site and consider joining. Next year’s Blogpaws Conference will be held in sunny Phoenix, Arizona. If you’re interested in attending, be an early bird and get your tickets by June 5, 2015 (before prices go up).